VITA ENAMIC® - A new definition of stability. A new definition of stability. Increase profitability with a simplified workflow for up to 50% faster chairtime and proven clinical performance. Only ENAMIC delivers the perfect blend of properties, like elasticity and rigidity, which most closely resembles the characteristics of a natural tooth. *) These are recommended indications; the entire range of single tooth restorations can normally be fabricated. For details, please refer to the respective working instructions of the products. **) Limited range of shades for VITA ENAMIC IS-16 and discs: available in 1M1, 1M2, 2M2, 3M2 and 4M2. *) This geometry in only available in High Translucent. VITA ENAMIC for CEREC/inLab, 5 pcs. VITA ENAMIC UNIVERSAL, 5 pcs. VITA ENAMIC IS, 5 pcs. Note: VITA ENAMIC DISCs can be processed with all open CAD/CAM systems, which are suitable to mill discs with a diameter of 98.4 mm (including the circumferential groove). *) Note: The range of VITA CAD/CAM material versions/geometries/shades available may vary for individual CAD/CAM system partners or systems. The hardware and software requirements in each case are available from the respective CAD/CAM system partners. Take advantage of beneficial new materials and technologies! The subgingival preparation border of the abutment exceeds 0.5 mm. What must be kept in mind? A dry treatment site must be provided for the adhesive bonding technique. Rubber dam and/or retraction cords are suitable for keeping the site dry. Please make sure that any excess bonding material is completely removed from the sulcus. Does VITA ENAMIC contain residual monomer? Due to the industrial fabrication of VITA ENAMIC using a combination of hot curing and pressure application, all parameters are ideally arranged. As a result, with VITA ENAMIC (polymer part), a complete absence of residual monomers is guaranteed. I want to bond my VITA ENAMIC crowns to abutments using conventional techniques? Is this permissible? Conventional bonding using cements is contraindicated since sufficient load capacity and retention of the VITA ENAMIC crown on the abutment is only achieved by adhesive bonding. ....... and if so, how? You can perform surface characterization using the VITA ENAMIC Stains Kit. It is comprised of a shade powder and liquid, which you should apply to the surface after it has been conditioned and prior to light-curing. A light-curing glaze is then applied as a seal. What milling tools can I use to process VITA ENAMIC surfaces? As indicated in the working instructions, only diamond-coated milling tools should be used. We advise against using carbide milling tools for finishing. Due to the high proportion of ceramic-network content, this could lead to abrasion, and as a result, to black streaks or spots on your restoration. For polishing, we recommend the VITA ENAMIC Polishing Set instruments. .... to repeat the application before continuing the work? To ensure reliable bonding of abutment and crown, the abutment needs to be degreased with ethanol before further processing and the process step of "Priming" needs to be repeated. After applying VITA ENAMIC Glaze, my surface is "streaked". What could be the reason for this? VITA ENAMIC Glaze is a light-curing resin. That is why you should ensure that no direct light sources are directed onto the object during application. You should also avoid brushing the same area several times with the brush. This can also result in streaks. My surface is still sticky after using VITA ENAMIC Stains, what is the reason for this? must be dry after curing, and no longer sticky. The surface is similar to that of a polished crown. Reworking is not required. ..... Glaze or polished to high gloss? Subgingival portions of the crown should be polished since a high-gloss surface of a crown reduces plaque accumulation. Should VITA ENAMIC crowns be temporarily bonded to abutments? Temporary bonding of VITA ENAMIC crowns to abutments is not recommended since the required load capacity is only guaranteed after definitive and firm bonding of the VITA ENAMIC crown. When should I use HT blocks and when should I use T blocks? 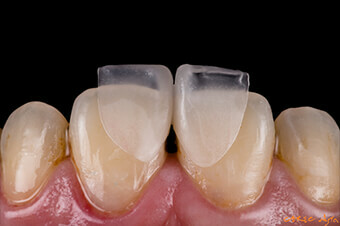 HT (High Translucent) are used for inlays and onlays, all-ceramic and partial crowns, as well as for veneers. HT block materials offer a very beautiful chameleon effect. This makes them particularly suited to natural dentition when transferring the shade of the tooth stump. T (Translucent) are better for masking the underlying structure thanks to greater shade intensity, which is why we recommend it for discoloration and decalcification, as well as for older patients with a reduced proportion of enamel. How is it possible that I can etch the surface of VITA ENAMIC? The silicate ceramic network is ideally suited to etching and provides a highly retentive etching pattern for micro-mechanical bonding between the material and the luting composite. That is a significant difference between ENAMIC and composite materials. .... (Al2O3) prior to bonding the crown? Is it also possible to sandblast with glass beads? Defined surface enlargement and mechanical roughness are only achieved by sandblasting the abutment with Al2O3 prior to bonding the crown; in combination with the chemical compound (using a primer), reliable adhesive bonding of the crown to the abutment is achieved. Glass beads are not suitable for this purpose. Why do I need to condition the surface prior to staining and glazing? In order to achieve effective bonding between the VITA ENAMIC surface and the characterization material or the luting composite, the surface of the VITA ENAMIC material must be conditioned. This is due to the high proportion of ceramic-network content. You have two possible approaches to choose from. You can either etch the material using a 5% hydrofluoric acid gel such as VITA CERAMIC ETCH, or you can sandblast it using AL2O3 of max. 50 µm at a pressure level of max. 1 bar. .... for adhesive bonding of VITA ENAMIC crowns to zirconia abutments? These monomers in the primer/bonding agent and/or bonding composite enable chemical bonding of the sandblasted zirconia surface and the bonding material. What effect does silanization have on the surface? ceramic network and luting materials as well as VITA ENAMIC Stains. .... and what needs to be done in cases of screw loosening after bonding of the crown? In such cases, simple trepanning of VITA ENAMIC crowns with a suitable milling or grinding tools can be carried out. Then prepare the access to the screw channel of the abutment. Tighten the prosthetic screw to the prescribed torque. Then follow the recommendations to seal the screw channel. Use phosphoric acid gel (30 sec) to clean the opening in the crown and then apply an adhesive/silane bonding agent. Light-curing restorative composites with high opacity are suitable to seal the opening. Please observe the corresponding instructions for use. What hardware and software requirements must I meet in order to process VITA ENAMIC? As a user, ideally you will need a CEREC/inLab MC XL milling system and the corresponding 3D software from Version > 4.0 to perform processing. It is important to note: VITA ENAMIC offers excellent milling properties – it can be processed more quickly, and at the same time, does not wear milling tools to the same extent. So that the material can also be milled with the small CEREC / inLab milling system and using software versions earlier than 4.0, please select VITABLOCS Mark II, I14. .... walls caused by a titanium abutment? In such cases, high-opacity bonding materials with masking capacity should be used. Translucent adhesive materials, which are used, e.g. for veneers, are less suitable. How should bonding be performed with VITA ENAMIC? Adhesive bonding of VITA ENAMIC restorations must be performed using light-curing or dual-curing fine hybrid composites. A self-adhesive composite such as RelyX Unicem from 3M ESPE can also be used for bonding crowns (dentin adhesion). Adhesive bonding of crowns should preferably be performed using a flowable, dual-curing composite (depending on the thickness of the layering). In order to achieve a natural surface shine, we recommend a two-step approach. 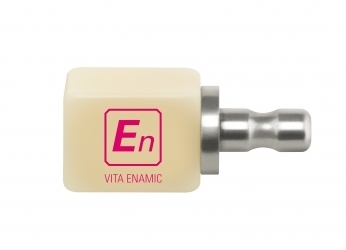 The VITA ENAMIC Polishing Set provides special polishing instruments for this purpose. You should ensure that the specified rotational speed is observed in this case and work at a low level of contact pressure. These polishing tools have been specially designed for the new material, allowing you to achieve ideal results. For custom surface design, you can then use a goat hair brush and diamond polishing paste to achieve a surface shine tailored to your particular needs. How is the screw channel of the abutment sealed prior to adhesive bonding of the VITA ENAMIC crown? To seal the screw channel, first apply gutta-percha, Teflon tape, or a similar material into the screw channel; then apply a suitable bonding agent into the opening and seal it tightly using a light-curing restorative composite. Clinical case. How Thin is Thin? The story of our single-visit ultrathin veneer challenge. With VITA ENAMIC. CEREC Digest was founded in 2016 by Hsuan Chen (陳鉉) and Cheng-Han Li (李承翰). The plan was to create a channel that focuses on the CEREC system and dental CAD/CAM in general. The website was launched in January of 2017 as a joint effort between CEREC Asia, a training center based in Taiwan, and the Tooth Faerie Club, a 50-person study club created by Hsuan and Cheng-Han. The Digest caters primarily to the demographic of dentists and dental technicians who are interested to learn more about digital dentistry.